Atlanta, GA: Aparna’s Dance Academy celebrated its 9th Kathak Utsav at Alliance Theatre of Woodruff Art Center,Atlanta GA earlier this year. The modern atmosphere atWoodrufffArtCenterburst into new life with colorful and traditional Indian dresses, sounds of ghugurus and Indian classical music. After a successful show, Aparna Sharma, the Director of Aparna’sDanceAcademy, said: “It is natural to see people attracted to our traditional Kathak dance, which has thrived for centuries. 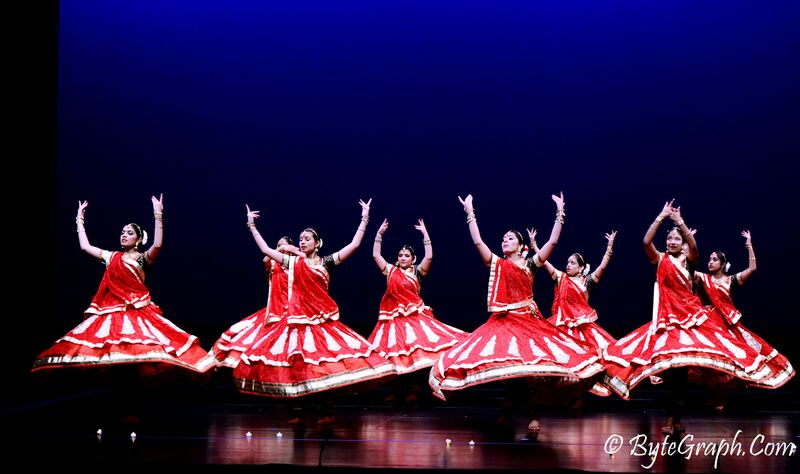 Kathak is our cultural asset and gift from our previous generations. Our job is to preserve and promote it to our next generation. I am just following this tradition taught to me by my guruji”. In Kathak Utsav tradition, the first item is always a vandana. This year the performance was on a Ganesh Vandana, composed by “Atul-Vijay”. The dance started with serene Ganesh poses and quickly picked up speed as song progressed, on the bols of Ganapati Bappa Moriya, ending with classic Jaipur gharana fast chakkars (pirouettes) matching the passion and speed of the song. “Each year, a new group of student gets an opportunity to perform for the curtain raiser, “said Kamal Mohanty, the anchor for the show, “Think about the pressure that brings on the young shoulders. This year, students performing this very important item are the youngest group of students than ever before. But they are very well prepared”. A group of senior students later joined in the performance. During the next two hours, Aparna’s students entertained audience with their performances on raag malkauns, on a contemporary composition by Bikram Ghosh, and a Varsha ritu composed by Aparna herself among many performances. Very young students performed on selected Hindi film songs, likes of “Bhumro” from Mission Kashmir among others. “Indian folk dances have a special place in Kathak Utsav”, said Kamal Mohanty,”Just like Kathak, folk dance and music is out cultural heritage. Our rich culture is no more apparent than in our folk dances and music. Even Hindi movies music and songs are often based on folk music. One of the most popular and classic folk song in Rajasthan, is Nimbooda. It became even more popular once it was adopted in a Hindi movie.” Students in traditional and colorful rajasthani dresses performed energetically and beautifully, on this very popular song. The song Nimbooda though filmed in Gujarati settings is originally from Rajasthan, often performed by Manganiyars community. Aparna Sharma, in her solo performance, demonstrated, how it is done. In her performance on a sargam, composed by her guru, Shri Rajendra Gangani, Aparna took the Kathak performance to new heights. Aparna displayed unbelievable speed, grace, beauty and expressions with unbounded energy in her kathak performance. Cheers and applause from audience and students for their teacher was deafening. Later in the show, Aparna and her two sisters, Rita Sharma, and Tina Sharma also known as “The Sharma Sisters”, performed a classical and a contemporary Kathak dances. 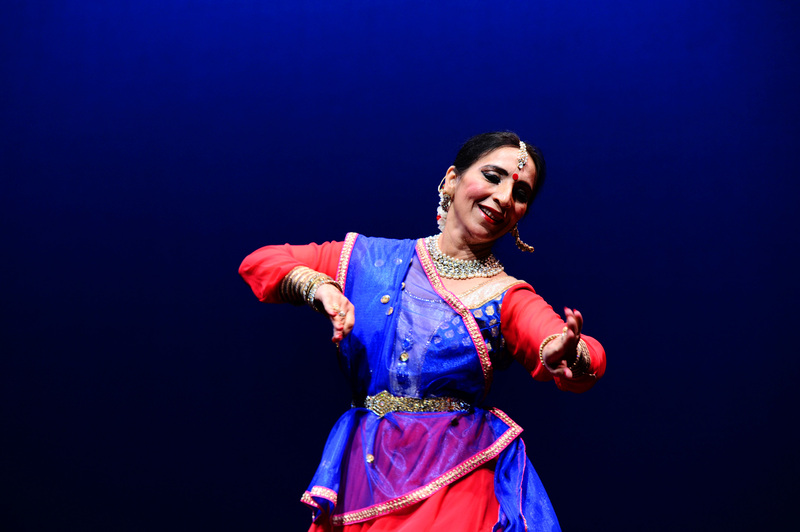 The beauty, finesse, intricacies of quick hand movements, rhythmic tatkar, and highly synchronized Kathak chakkars are just a few adjectives that do not describe justifiably what the audience experienced during the live performance on May 18th. The “Sharma sisters”, as they are known in Kathak world, were also clearly enjoying themselves performing as much as the audience at the show.